Traditional Indian Ayurvedic medicine uses complex treatment approaches, including manual therapies, lifestyle and nutritional advice, dietary supplements, medication, yoga, and purification techniques. Ayurvedic strategies are often used to treat osteoarthritis (OA) of the knee; however, no systematic data are available on their effectiveness in comparison with standard care. The aim of this study is to evaluate the effectiveness of complex Ayurvedic treatment in comparison with conventional methods of treating OA symptoms in patients with knee osteoarthritis. In a prospective, multicenter, randomized controlled trial, 150 patients between 40 and 70 years, diagnosed with osteoarthritis of the knee, following American College of Rheumatology criteria and an average pain intensity of ≥40 mm on a 100 mm visual analog scale in the affected knee at baseline will be randomized into two groups. In the Ayurveda group, treatment will include tailored combinations of manual treatments, massages, dietary and lifestyle advice, consideration of selected foods, nutritional supplements, yoga posture advice, and knee massage. Patients in the conventional group will receive self-care advice, pain medication, weight-loss advice (if overweight), and physiotherapy following current international guidelines. Both groups will receive 15 treatment sessions over 12 weeks. Outcomes will be evaluated after 6 and 12 weeks and 6 and 12 months. The primary endpoint is a change in the score on the Western Ontario and McMaster University Osteoarthritis Index (WOMAC) after 12 weeks. Secondary outcome measurements will use WOMAC subscales, a pain disability index, a visual analog scale for pain and sleep quality, a pain experience scale, a quality-of-life index, a profile of mood states, and Likert scales for patient satisfaction, patient diaries, and safety. Using an adapted PRECIS scale, the trial was identified as lying mainly in the middle of the efficacy-effectiveness continuum. This trial is the first to compare the effectiveness of a complex Ayurvedic intervention with a complex conventional intervention in a Western medical setting in patients with knee osteoarthritis. During the trial design, aspects of efficacy and effectiveness were discussed. The resulting design is a compromise between rigor and pragmatism. Among chronic diseases, osteoarthritis (OA) is becoming increasingly significant and is responsible for a major part of the disease burden, work disability, and healthcare costs in Germany, Europe, and worldwide . The guidelines for treatment of OA of the knee from the National Institute for Health and Clinical Excellence, the American College of Rheumatology and the European League Against Rheumatism recommend nondrug treatments, including the education of patients, social support, physical exercise, and weight loss [2–5]. Nonsteroidal anti-inflammatory drugs (NSAIDs) are still used as the initial treatment in primary care [6, 7]; however, they are associated with a number of side effects, such as upper gastrointestinal bleeding and renal failure , as well as myocardial infarction and stroke, especially in the COX-2 inhibitor category . Patients with osteoarthritis as pars pro toto for chronic diseases often seek complementary and alternative medicine (CAM) therapies . Ayurveda, is the most prominent medical system of traditional Indian medicine, and is commonly used throughout South Asia. It has been practiced there as a whole system of medicine for more than 2000 years. Ayurveda is one of the oldest systems of medicine worldwide and is acknowledged as a medical science by the World Health Organization [11–13]. In India alone, more than 400,000 Ayurvedic physicians are officially registered; Ayurveda can be studied and applied systematically at more than 250 government-accredited universities or colleges . Ayurveda is also playing an increasing role in European and North America, since its broad introduction in Western countries in the 1980s. At present, it is one of the fastest-growing CAM therapies worldwide [12, 15–22]. Ayurveda claims to be effective in treating chronic diseases of the musculoskeletal system [23–25]. It uses complex and individually tailored interventions, including manual therapies, lifestyle and nutritional advice, dietary supplements, medication, yoga, and purification measures . Ayurveda has its own sophisticated diagnostic system; OA generally belongs to a cluster of diseases in which the Ayurvedic principle of kinetic energy, ‘vata’, prevails. Thus, a reduction and regulation of the aggravated principle of kinetic force stands to the fore of a complex Ayurvedic treatment approach for OA of the knee . However, the conventional diagnosis ‘osteoarthritis of the knee’ cannot be directly translated into the Ayurvedic diagnostic system. As an approximation, the Ayurvedic term ‘[janu-] sandhi-gata-vata’ (literal translation from Sanskrit: ‘vata is seated [has moved] in [into] the [knee-] joint’) is most commonly used by the Ayurvedic fraternity. However, sometimes other Ayurvedic diagnoses may also apply (for example, khuda-vata, ama-vata, jirna-vata, vata-rakta). According to Ayurveda, the causes of OA are most often attributed to improper diet, unfavorable life style, trauma, aging processes, and constitutional predispositions. This favors an aggravation of the principle of vata, responsible for all movement, musculoskeletal, and locomotor functions in the body. The aggravated principle of vata brings dryness (rukshata), lightness (laghutva), porosity (saushirya), and coarseness (kharatva) into the joints. Corresponding to Ayurvedic models of pathogenesis, the disease is caused when the aggravated principle of vata settles in the knee joint and begins to destroy the structure and function of the joint. The features seen in OA and sandhi-gata-vata are similar. In the Ayurvedic disease-entity, pain in the knee joint (sandhi-shula) is the main feature and can be accompanied by other features including swelling (shotha), stiffness (stabdhata), crepitus (atopa) and difficulties in performing proper functions of the knee joint [23, 24, 27–29]. Most noticeably, Ayurveda and conventional Western medicine are based on different sets of logical axioms. It can be difficult to identify precise correspondences between related disease entities within these two systems of disease classification [30–35]. Mean-value based medical strategies are avoided in the constitution-based Ayurvedic approach. Moreover, nomenclatures for disease entities are seen to be of lower importance than nomenclatures for ‘milieu interior changes’ in Ayurvedic medicine . Besides symptom detection, Ayurvedic diagnosis involves a general investigation into a broad spectrum of internal and external conditions, including physiological, metabolic, kinetic, excretory and mental functions, life style, food habits, social and other factors, all capable of developing disharmonies within the patient’s mind-body continuum. By inquiring into a patient’s history and investigations based on refined sense perception (palpation, auscultation, percussion, inspection, and so on), these factors are analyzed and evaluated. Pathogenic disharmonies are classified in terms of dynamic Ayurvedic principles, which cannot be directly equated with modern entities (and have to be explained in other ways, for example, dosha, agni, srotas, dhatu, mala, ama). These principles are found in distinct states and individual pathological constellations and may result in specific symptoms. Furthermore, healthy states and disease are seen as a continuum in Ayurveda. Diagnosis is believed to be the definition of a snapshot within a constant flow of physiological and pathophysiological factors. This enables the Ayurvedic physician to treat a case without giving the disease a name, by dealing with the aforementioned principles . As an example, osteoarthritis of the knee may be accompanied by (in Ayurveda) so-called ‘aggressive intermediate metabolic products’ (ama), leading to systemic or local joint pathologies, resembling, but not equating, features of rheumatoid arthritis, other autoimmune conditions or gout. Consequently, the Ayurvedic diagnosis may not be (janu-) sandhi-gata-vata, but another diagnosis, such as ama-derived situations (ama-vata) or the effects of a ‘hot-acidic blood tissue’ (vata-rakta). However, in conventional medicine, the diagnosis osteoarthritis of the knee would remain the same in all three cases. Ultimately, an experienced Ayurvedic physician would treat the principles of vata, ama, or rakta, rather than a circumscribed diagnosis. Summarized, standardized diagnosis and therapy are avoided in constitutional Ayurvedic medicine; the overall situation of the patient is analyzed, rather than merely the disease . There is some clinical evidence of the effects of Ayurvedic therapies for OA that derives from a limited amount of clinical studies, largely from South Asia [26, 36–70]. Most of these trials show limitations regarding their trial designs or methodological transparency. However, Ayurveda is a whole medical system using complex treatment approaches. In theory and practice, it is fundamentally based on constitutional axioms. Ayurveda (alongside its somatic approaches) intentionally includes mind-body and psychosomatic aspects in diagnosis and therapy of all diseases. Complex treatments follow the theory that the combination of different treatment elements exerts synergistic effects and is relevant for the outcome [71, 72]. However, to date, no clinical study on OA has been performed that has taken into account the multidimensional approach of Ayurveda as a complex and whole medical system. Another limitation of all previous randomized controlled studies on Ayurveda is that they have focused only on structural Western diagnoses and disease cognitions without considering the fundamental principles of the traditional Ayurvedic diagnostic approach. As for Western countries, there are very limited amounts of clinical data on single Ayurvedic interventions (for example, leeches [73, 74] and ginger extract [75, 76]) and no data for complex Ayurvedic treatment of OA. To date it is unknown whether such a complex treatment approach has a clinically relevant effect and whether its effectiveness can exceed the effectiveness of conventional standard care for OA. Moreover, it remains unclear whether local and geographical aspects influence the therapeutic outcome, for example, when Ayurveda is being practiced outside its countries of origin. Overall, there is a need for more evidence from comparative studies in medicine , in order to assist healthcare stakeholders in informed decision making. This is also the case for traditional Indian medicine as pars pro toto for CAM and is especially recommended for the comparison of whole medical systems like Ayurveda . The generation and synthesis of evidence comparing the benefit and harm of alternative methods to prevent, diagnose, treat, and monitor a clinical condition or to improve the delivery of care is called comparative-effectiveness research . Our clinical hypothesis is that 12 weeks of complex Ayurvedic treatment based on Ayurvedic diagnosis is more effective than 12 weeks of conventional standard care in the treatment of OA of the knee (based on the WOMAC Index). The aim of this study is to compare and evaluate the effectiveness (measured with the WOMAC Index) of a complex individualized Ayurvedic treatment based on Ayurvedic diagnosis in comparison with conventional medical care for osteoarthritis of the knee following current international treatment guidelines for patients with OA of the knee. We include patients who fulfill the following criteria: men and women aged 40 to 70 years, who have OA of the knee, as prediagnosed by a specialist (such as an orthopedic specialist or surgeon or a radiologist) according to the American College of Rheumatology criteria [3, 80]. Radiologic changes of the knee in the images used by the specialist when diagnosing OA should be a Kellgren-Lawrence score of at least grade 2 in X-ray [81, 82] or a Recht grading score of at least grade 2(a) in MRI [83–85]. The patients will have reported a mean pain intensity in the affected knee of ≥40 mm on a 100 mm visual analog scale over the 7 days before baseline assessment, and provide written informed consent. Patients are excluded for the following criteria: the pain in the knee is caused by congenital dysplasia of the affected knee, rheumatoid arthritis, autoimmune diseases, malignancies, knee surgery or knee-arthroscopy; the patient has been administered any chondroprotective drugs, intra-articular injection into the affected knee joint or systemic medication with corticosteroids during the preceding 3 months; the patient has begun any new treatment for OA during the previous 4 weeks (except analgesic treatment with paracetamol or NSAIDs available over-the-counter); the patient is pregnant or breastfeeding; the patient has an acute mental disorder, a serious acute organic disease, or a serious chronic comorbidity, or is obese (at least WHO grade II); the patient has a blood coagulation disorder, or takes coagulation-inhibiting medication other than acetylsalicylic acid and clopidogrel; invasive measures have been performed at the affected joint during the previous 12 weeks or are planned for the following 12 month; or the patient is in the process of applying for pension or disability benefits. Furthermore, patients are excluded if they had any serious comorbidity that made it impossible to participate in the trial interventions (for example, heart failure NYHA IV). Patients are recruited from the Immanuel Hospital and Charité Medical University Berlin outpatient clinics. In addition, patients are being informed about the trial in media reports and advertisement in local newspapers. The study was approved by the ethics committee of the Charité University Medical Center (No. EA1/124/10) and is conducted according to the common guidelines for clinical trials (Declaration of Helsinki). The trial registration number is NCT01225133. Informed consent is obtained for all patients. The trial is in the recruitment phase. Patients are randomized to Ayurvedic or conventional treatment in a 1:1 ratio on the basis of a stratified (strata defined by study site) block-randomization (variable block lengths). The study biometrician generated a randomization list with SAS/STAT software (version 9.1, SAS Inc., Cary, NC). The randomization list is stored by the data manager on a secure database (Microsoft Office Access 2007), where the randomization list is not accessible to any other staff members or study physicians. After registration of the patient details in the secure database, the study nurse has to click a button to perform randomization. Each patient can be only registered and randomized once: the database does not allow any patients details to be deleted. In this prospective, multicenter, randomized controlled trial, all patients included into the study receive an Ayurvedic diagnosis before randomization. After randomization, patients in the Ayurveda group receive a complex individualized Ayurvedic treatment tailored according to their Ayurvedic diagnosis. 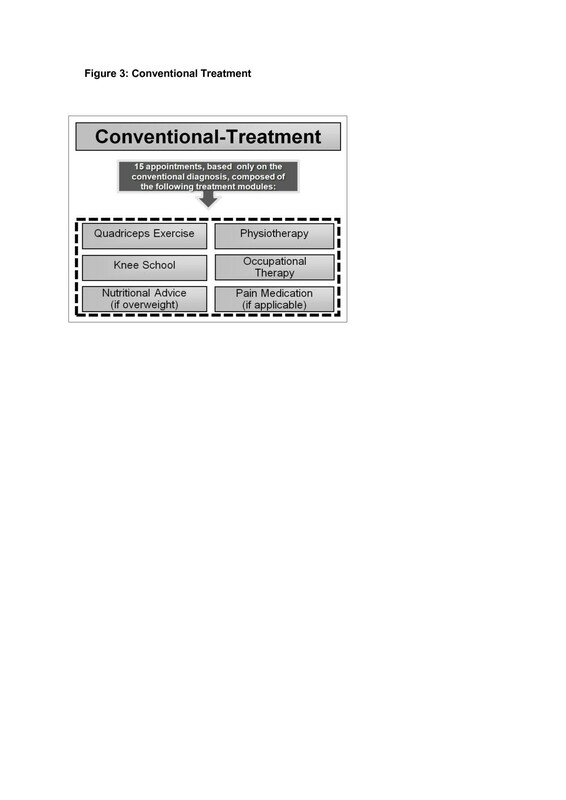 Patients randomized into the conventional treatment group will receive conventional medical treatment following current guidelines (Figure 1). Because all patients receive the Ayurveda diagnosis, we exclude the context effects of this procedure from our results (for further explanations on design aspects see ). The treatment will be performed in two trial centers in Berlin, Germany. To improve the validity of the Ayurvedic diagnosis within the trial, the first 30 patients recruited for the trial were included in an embedded diagnostic trial (to be reported elsewhere). After inclusion into the trial, they were diagnosed by four independent Ayurvedic medical specialists, each of whom documented an individualized treatment plan for the patient with the help of a standardized form. All assessment and treatment plans for the first 30 patients were discussed between the doctors until consensus was reached for each patient. The results will be reported elsewhere. The primary outcome measure will be rated using the Western Ontario and McMaster University Osteoarthritis Index (WOMAC) after 12 weeks [87, 88]. We used the 10-point numeric rating scale, as described in the German version, and normalized the results to a 100-point scale. If the patient has bilateral OA of the knee and both knees fulfill the eligibility criteria, the WOMAC Index is used for the same knee throughout the whole study period; the knee that affects the patient most at baseline. Secondary outcome measures will be made using WOMAC subscales (pain, function and stiffness), a pain disability index, a visual analog scale for pain and quality of sleep (0 to 100 mm), a pain experience scale, a quality-of-life index, a profile of mood states, Likert scales for general health-related patient satisfaction, and a patient diary for interventions and co-interventions (medication, yoga or exercise, self-applied massage, health services usage), and safety records (adverse events, serious adverse events). Outcomes will be documented at baseline, at 6 and 12 weeks, and at 6 and 12 months. The Ayurveda intervention is multimodal and follows the principles of Ayurveda as a whole medical system. The Ayurveda intervention was developed over 18 months in an international consensus procedure including experienced Ayurveda experts from India, Germany, and Italy. In addition, it was based on classical Ayurvedic literature [23, 24, 27, 28]. Treatment includes a tailored combination of manual treatments and massages, nutritional advice, specific consideration of selected food items and nutritional supplements, general and specific lifestyle advice, yoga posture advice for the knee and daily self-applied home knee massage. Patients receive 15 treatment sessions up to a maximum of 90 minutes each (Figure 2). To ensure the highest treatment quality, the therapeutic regimes for the first 30 patients were outlined independently by four Ayurvedic medical experts and the patients received the consensus-based therapy. Patients randomized into the control group receive conventional standard care for osteoarthritis of the knee according to the current international guidelines [4, 89, 90]. Conventional standard care treatment is provided by orthopedic specialists, surgeons, physiotherapists, and occupational therapists. In Germany, OA is usually treated by orthopedic specialists or surgeons, according to treatment guidelines issued by the German Association of Orthopedics. The treatment (Figure 3) is individualized and includes quadriceps muscle strengthening exercises, local physiotherapy including manual therapy and friction massage, occupational therapy, advice for individual knee exercise (knee school), if a patient is overweight or obese dietary advice for weight loss, if necessary administration of medication according to the current guidelines. Patients receive 15 sessions with a duration of 45 minutes. In the Ayurveda group all involved medical doctors had undergone either a regular university program for Ayurveda in India (Indian experts) or at least 500 hours of academic training in Ayurveda plus at least 2 years of continuous clinical experience with Ayurveda (European experts). All other involved Ayurvedic therapists require a minimum of 2 years of continuous clinical experience in their corresponding field of expertise (manual therapies, nutritional advice, lifestyle advice, knee yoga counseling). To ensure the highest treatment quality, the therapeutic regimes for the first 30 patients were outlined independently by four Ayurvedic medical experts (all medical doctors) and the patients received the consensus-based therapy. This was assessed in an embedded diagnostic trial; the results will be presented elsewhere. In the control group, the individual intervention is prescribed by medical doctors with a specialized degree in orthopedics, surgery, or physical medicine or by other medical doctors working in orthopedics, orthopedic surgery, or physical medicine under the direct guidance of a specialist for orthopedics or orthopedic surgery. All other involved therapists (physiotherapy, occupational therapy) require a completed training in their field and a minimum of 2 years of continuous clinical experience. The intervention takes place in hospital departments or hospital-affiliated centers for orthopedics, surgery, physical medicine, physiotherapy, or occupational therapy. This study is designed to have 80% power to detect a 10-point improvement (change from baseline) on the WOMAC Index after 12 weeks between both groups (common standard deviation = 20, two-sided t-test α = 0.05). To achieve this, 64 patients per group are needed; to take dropouts into account, 75 patients per group will be included, resulting in a total of 150 patients. The primary analysis population is the intention-to-treat population, which includes all randomized patients, who provided baseline data, regardless whether or not they adhere to the protocol or give a complete set of data. The primary outcome is a change in the score on the WOMAC Index after 12 weeks. Missing data will be multiply imputed by maximum-likelihood based regression methods. Overall, 20 complete datasets will be generated. Generalized linear mixed models will be fitted to each of these datasets, including study centers as a random effect, treatment group as a fixed factor, and the patient’s baseline WOMAC score as a linear covariate. The 20 concurring results (one for each copy of datasets) will be adequately combined. Results will be presented as adjusted WOMAC means per group with 95% confidence intervals and two-sided P value for the treatment group comparison. For sensitivity analysis, this statistical model will be extended to include the patients’ and physicians’ expectations as ordinal fixed factors to the generalized linear mixed model. Additional sensitivity analyses include the use of other computation methods, calculation of results based on the full analysis set (patients without missing WOMAC data at week 12), and the inclusion of potential confounding factors in the model in case of relevant baseline differences between the treatment groups. A detailed statistical analysis plan will be developed before analyzing the data. It is essential to distinguish between ‘efficacy’ and ‘effectiveness’. ‘Efficacy’ refers to ‘the extent to which a specific intervention is beneficial under ideal conditions’ . Many randomized controlled trials are efficacy trials, particularly those conducted for regulatory drug approval. They aim to produce the expected result for an intervention under carefully controlled conditions chosen to maximize the likelihood of observing an effect, if it exists. The trial population and setting of efficacy trials can differ in important ways from the clinical settings in which the interventions are likely to be used . By contrast, ‘effectiveness’ is a measure of the extent to which an intervention, when deployed in the field in routine circumstances, does what it is intended to do for a specific population  and therefore can often be more relevant to policy evaluation and the healthcare decisions of providers and patients. 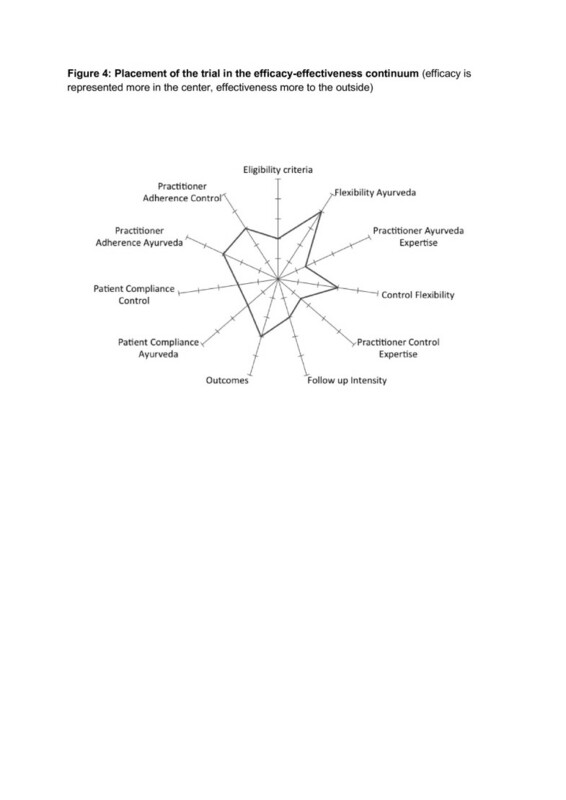 The pragmatic-explanatory continuum indicator summary (PRECIS) tool  was used to guide the design of the trial along ten dimensions of the efficacy-effectiveness continuum. PRECIS was adapted rating the items patients’ compliance and practitioners’ adherence for both interventions separately, and deleting the item primary analyses. Seven authors (CMW, Andreas Michalsen, CK, Antonio Morandi, LK, SG, MM) independently carried out the first rating using a five-point scale (1, maximum efficacy, displayed in the center of the figure; five, maximum effectiveness, displayed at the edge of the figure ). Results were displayed and harmonized in a second rating. 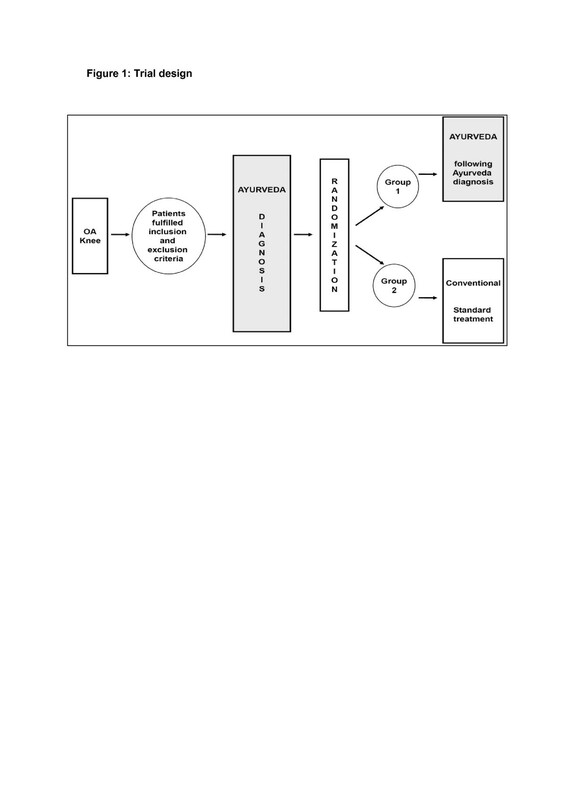 The trial is multidimensional and can be seen to lie mainly in the middle of the efficacy-effectiveness continuum (Figure 4). As shown in the figure, the flexibility of both interventions (Ayurveda and conventional care) is high and represents more the effectiveness side of the trial, whereas follow-up intensity, practitioner adherence, and patient compliance represent more the efficacy side. This represents very well the efforts that have been made during the trial-planning phase to produce a trial that allows a patient-centered individualized treatment, but at the same side tries to exclude some bias. Placement of the trial in the efficacy/effectiveness continuum (efficacy is towards the center, effectiveness towards the edge). This trial compares for the first time the effectiveness of a complex Ayurvedic intervention with a complex conventional intervention in a Western medical setting. Our aim was to develop a high-quality study that compared both medical systems ‘head-to-head’ and allows a complex tailored intervention in both groups. Reviews of research studies on Ayurvedic medicine so far reveal that the majority of them are experimental, focusing on single herbs, formulations, or therapies. A minority of existing Ayurveda research is clinical, focused either on medication only or on nonpharmacologic interventions, such as yoga. Most of these trials have methodological limitations ([21, 95]). Recently, a change of this trend could be observed in a randomized controlled trial on rheumatoid arthritis, successfully demonstrating that the individualized Ayurvedic treatment approach can be incorporated in a standard randomized controlled trial and that blinding can be successful, even where more than one placebo preparation is required [96, 97]. However, although the work of Furst et al. was of great importance for future randomized controlled trial studies on other CAM disciplines , in particular on whole medical systems, it did not fully test the multidimensional aspect of Ayurvedic therapy, since it included the pharmacological dimension only. Overall, Ayurveda has rarely been studied in its whole and multidimensional perspective and in the manner in which it is actually being practiced. The main challenge is to develop novel and innovative clinical study protocols to evaluate whether Ayurveda and its logic foundations are able to generate clinical evidence in full accordance with modern research methodologies. This will eventually allow the integration of traditional medical knowledge into modern science-based medicine. This clinical trial is the first attempt in this direction, since it makes full use of the complex and multidimensional therapeutic methodology of Ayurveda, individualized according to the patient’s needs. Nevertheless, using a trial design where neither patients nor providers or assessors can be blinded introduces bias. Expectation is discussed as one of the prominent mechanisms of the placebo effect ; by controlling for patients’ expectation in the statistical analyses, we try to reduce this bias. Another limitation is that the consultation duration between patients and providers differs in both intervention groups. However, this reflects the usual care setting of both medical systems. Reducing the consultation duration in the Ayurvedic group would not allow adequate treatment while reducing the consultation duration in the conventional group would introduce an artificial setting. In usual care, those patients who do not respond well to conventional treatment often become interested in complementary medicine. This could have introduced a bias towards Ayurveda. One method to reduce this bias could have been to recruit only incident cases of OA of the knee. However, this would have resulted in recruitment problems and less generalizability of the results, because patients usually seek complementary medicine treatments after they have already had the disease for some time. The Ayurvedic treatment was developed in a consensus procedure with Indian and European Ayurveda experts. The treatment protocol had to take into account German standards of medical care and the availability of Ayurvedic interventions in Germany. Because the Ayurveda treatment was based on Ayurvedic diagnoses, a diagnostic validation study was included to train the Ayurveda study physician. To ensure high-quality personalized treatment in the conventional group, the complex conventional intervention was based on current treatment guidelines for osteoarthritis of the knee and the final treatment protocol was developed in a consensus procedure with orthopedists and physiotherapists. In the conventional treatment group, intra-articular corticosteroid injections were not part of the treatment protocol, because in Germany many patients with osteoarthritis of the knee refuse this treatment. Furthermore, medication dosage was adapted to reduce the risk of gastrointestinal bleeding. Being aware that our approach reduces the generalizability of the results to other countries, we excluded them with the aim of reducing selection bias, to reduce the difference in the characteristics of those who are selected for the study versus those who are not. Although the study aimed to perform a ‘head-to-head’ comparison, for ethical reasons patients in the Ayurveda group are allowed to take rescue pain medication. This was the main reason for using a statistical hypothesis to determine whether Ayurveda is superior to conventional treatment, instead of using a noninferiority or equivalence approach. In the worst case, if both groups receive similar amounts of pain medication, the main difference between them would be in the different therapies offered to the two groups. The conventional group receives 15 45-minute sessions of individualized therapy including quadriceps muscle strengthening exercises, local physiotherapy including manual therapy and friction massage, occupational therapy, advice for individual knee exercise (knee school), and, where a patient is overweight or obese, dietary advice for weight loss. The Ayurveda treatment is a tailored combination of manual treatments and massages, nutritional advice, specific consideration of selected food items and nutritional supplements, general and specific lifestyle advice, yoga posture advice for the knee and daily self-applied home knee massage, in 15 treatment sessions lasting up to a maximum of 90 minutes each. In designing the trial, aspects of efficacy and effectiveness were discussed in depth; the resulting design is a compromise between rigor and pragmatism. We decided to apply several exclusion criteria to achieve a more homogeneous study population, for two reasons: safety and less variance in the outcomes. Although the treatment protocol for both groups allows flexibility, having only a very small number of centers trained in the diagnostic procedures and high-quality experts providing the treatment limits the degree to which these results can be generalized. Furthermore, controlling compliance and adherence represents elements of efficacy. However, this is the first ‘head-to head’ comparison in the West, where Ayurveda is mainly known as wellness intervention; it is useful to run a smaller trial in a more controlled environment before starting a large multicenter trial. Effectiveness trials on traditional medical systems obviously have to deal with difficulties based on system-dependent aspects of nomenclature, approaches, and paradigms. Future trials have to consider this and should try to incorporate both approaches into the study designs, to allow a better comparison of the systems involved. Accordingly, future trial methodology in this field cannot merely follow typical clinical drug trial methodology (‘one treatment fits all patients’), but should use an innovative approach and take traditional aspects from a whole-medical-system perspective into account, without at the same time violating the principles of evidence-based medicine research. For future research on Ayurveda, designs that allow more flexible interventions from a whole-systems Ayurvedic approach perspective (for example, dynamic principles, individuality and a tailored treatment approach, the concept of constitution, the milieu interior concept, and a focus on prevention and salutogenesis) should be tested. The study is recruiting patients. We thank Dr. Babu from CCRAS for his advice and Gunda Loibl, Sabine Saalfeld, Iris Bartsch, and Katja Icke for trial and data management. This study is funded by AYUSH, Government of India. CMW’s work is funded within the grant for the endowed Chair for Complementary Medicine Research by the Carstens Foundation. There are no financial or nonfinancial competing interests to declare in relation to this manuscript by any of the authors. CMW and CK drafted the paper and guided the group of authors through the editorial process. SR edited the section on statistics. Andreas Michalsen and MM worked substantially on all conventional aspects of the paper. Antonio Morandi, ES, SG, SH, MR, and LK took part in developing all parts related to Ayurveda and whole medical systems. All authors read and approved the final manuscript.